Canada is the sixth biggest wine importer in the world and 14% of its wine imports come from Italy. 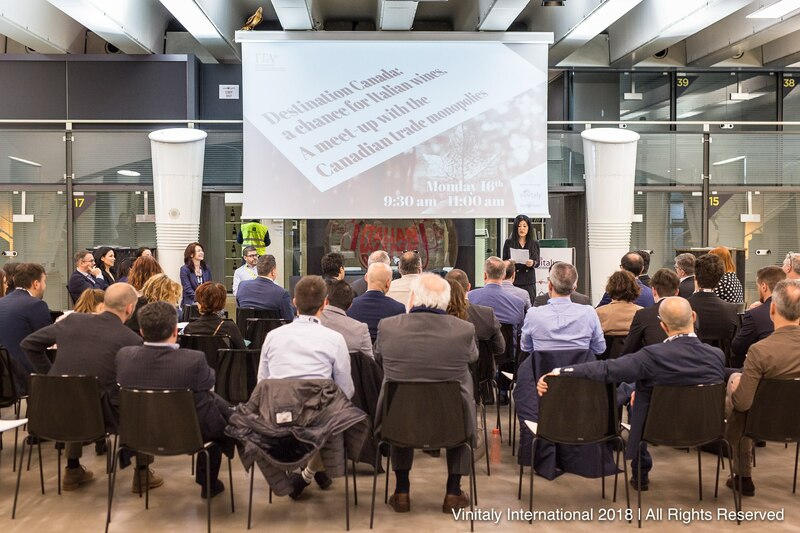 During Vinitaly 2018, the seminar “Destination Canada: Opportunities for Italian Wine. A meet-up with the Canadian trade monopolies” illustrated current trends and the interests of the Canadian market in Italian wine. In 2017, Italy exported 80 millions litres of wine to Canada (+9% from the previous year). Italy is the first supplier for volume and second only to France for value. Canada extends more than 7,821 km, from the Atlantic Ocean to the Pacific Ocean. Despite its harsh winters, Canada has made a name for itself in the wine industry. In Canada numerous microclimates produced by mountain ranges and bodies of water provided some of the world’s best areas for growing grapes. The most recognised areas for producing wines in Canada are the Niagara Peninsula in Southern Ontario and the Okanagan Valley of British Columbia. Canadians love their wines, yet they mostly prefer foreign brands. In 2017, Canadians drank 467 millions litres of wine, marking a 1.2% growth from the previous year. Of these 467 millions, 30% was locally produced, 14% was imported from Italy and 13% from the US. Canada is one of the major consumers of imported wines. Research conducted by Euromonitor International stated that, in the next 5 years, wine sales in Canada will register a 2.9% growth in volume and a 3.8% growth in value. While sparkling wines will register the higher growth, white wines sales will continue to grow faster than red wines’. Even if in the last few years Canadians started to approach producers from other markets such as Chile and New Zealand, Italy and France are still the Canada’s favorite. In 2017, Italy exported 80 millions litres of wine to Canada (+9% from the previous year). Italy is the first supplier for volume and second only to France for value. The relationship between Canada and Italy was the focus of the seminar “Destination Canada: Opportunities for Italian Wine. 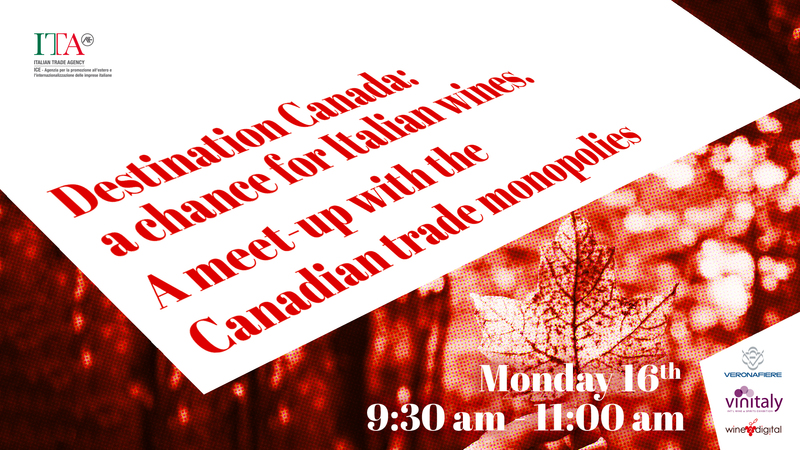 A meet-up with the Canadian trade monopolies” organized by Vinitaly International and the Italian Trade Agency (ICE). Managing Director of Vinitaly International Stevie Kim and ITA-ICE representatives Anna Flavia Pascarelli and Matteo Picariello welcomed delegates from 6 Canadian Liquor Boards on their very first trip to Vinitaly in Verona on on Monday April 16th. The Canadian delegation visited the exhibition and met Italian producers. Moreover, during the meeting at wine2digital, speakers introduced new programs for the promotion and purchase of Italian wines that are part of the new ITA-ICE support campaign for the wine sector. On the importance of this first-time gathering Stevie Kim also comments: “This seminar would have been a dream session for wine2wine, the wine business forum which gathers professionals at the end of the year when producers have more time on their hands. During Vinitaly producers are busier selling their wines and rightly so. However, we did not want them to miss out on this exceptional opportunity, since it was the very first time that the delegation traveled to Vinitaly. So we live-streamed the event and made their slides available online. I would like to thank the Canadian delegates for allowing us to share their helpful presentations.” “Destination Canada: Opportunities for Italian Wine” was a unique opportunity for Italy, one of the major wine producers, and Canada, one of the major wine consumers, to meet, discuss, and improve their commercial relationship. Leah Anderson, Angela Pyne, Paul Henderson.